One of the nice things about online genealogy sites like Ancestry or FamilySearch is that they provide you with “hints” about other records that might be relevant to your research on each person in your tree. Every time you click on a hint you will be faced with a list of records to consider for that person. This can be very useful for expanding your tree. Your provider’s computers will be running searches occasionally against their databases with all the information that you have already supplied for each person in your tree. If there are new datasets added to their service that match people in your tree, or if another user of their service has added a person to their tree that matches yours, you will get a hint flagging the person in your tree. So far, that’s great. 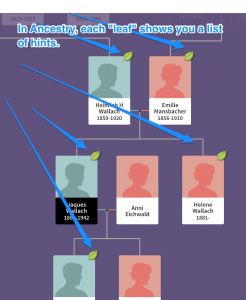 More hints means more evidence matching your person to a vital record, or giving you a connection to the research of another genealogist who has expanded the research on that branch a little further. Here is the problem … information overload. Your tree consists of nodes, which represent either individual people, or a married couple. Each person node is connected to at least one family node — representing the persons’s parents. In most cases, each person node is also connected to a second family node, for that person’s spouse. Depending on how many children were in each family, the growth can be exponential. This is especially true if you are the family genealogist, and everyone is reporting new family members and connections. You learn about a new family, and before you know it, there are a bunch of hints: each census, residence, marriage, death, immigration, naturalization could have a record available online. As you work each of those records, you might find other persons that are reported that belong in the family. You might find a hitherto unknown parent’s name or birthplace, or the entire family of a cousin, or the parent of the spouse of a cousin’s child. Family trees can branch up, down or out with each new person added. As you scan through your tree, it is hard to resist the siren’s call of the hint. Maybe your proof will be useful to someone else in the family doing their research some day. Perhaps the extended tree will give clues for where someone’s autosomal DNA came from. It is a little bit like eating potato chips or peanuts … stopping after one is not an option. In fact, this can inspire a bad case of what I call genealogy mania … where you just keep churning through parts of your tree updating things, losing sight of what you set out to accomplish when you first sat down to work it. When you find that you’re completely lost in adding people and data that seem to be a bit far away from your own family, it’s time to stop and take a break. Ask yourself: even though there is another hint beaconing: Do I really need to add the parents of the aunt of the wife of the first cousin twice removed of the wife of the husband of the grand-niece of the wife of the husband of your fourth great-aunt? 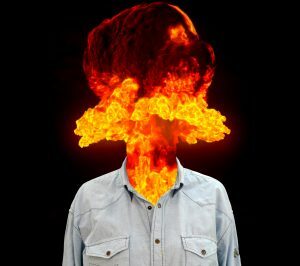 If you don’t stop, eventually, your head will explode. Prev Use the Source, Rob! I’m also with you there. I have 679 hints and never seem to get to them. Update … on Ancestry alone, I have 693 hints for 1,262 persons. Aargh!